Taking the boat to Phu Quoc Island is fun, reasonably priced, relatively easy, and a really convenient way to combine a trip to the island with travels in the Mekong Delta or the Cambodian coast. It’s also a great way to visit the island with your own motorbike or car. In the last couple of years, there’s been an enormous increase in boats between the mainland and Phu Quoc Island. There are now at least six different ferry companies operating fast boats and car ferries from the Mekong Delta towns of Ha Tien and Rach Gia to Bai Vong port on Phu Quoc Island. There are dozens of sailings in both directions, on both routes, every day throughout the year. The boats are fairly modern and comfortable, journey time is 1-3 hours depending on the vessel and the route, and prices for passengers and vehicles are very reasonable. 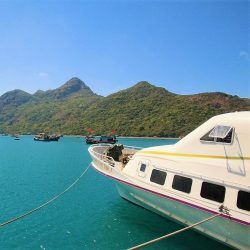 On this page, I provide all the information you need for taking the boat to Phu Quoc Island, including a full listing of sailing times and prices for passengers and vehicles. *Please support Vietnam Coracle: You can search boat times, prices, and make bookings directly from this page for fast boats (not car ferries) between Phu Quoc, Ha Tien & Rach Gia by using the Baolau.com search boxes & links throughout this guide. If you make a booking, I receive a small commission. All my earnings go straight back into this website. Thank you. 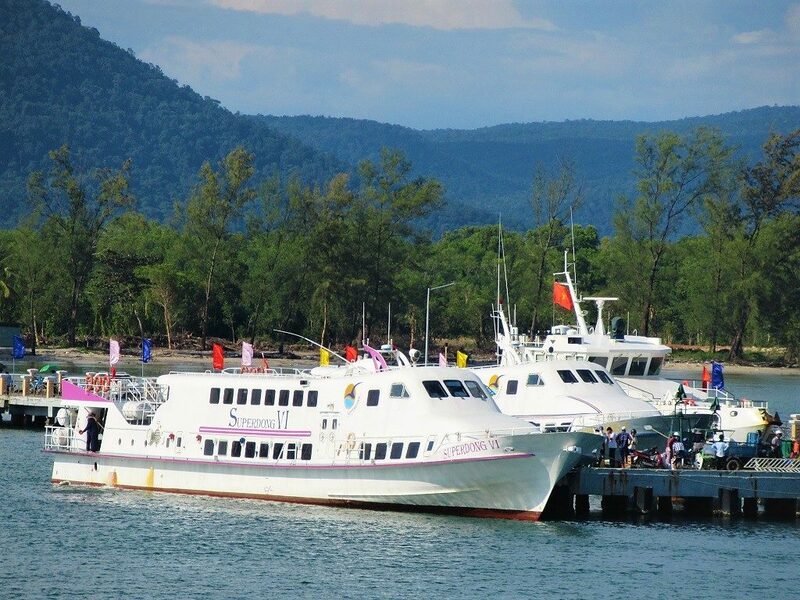 There are now at least six different ferry companies offering services between Ha Tien, Rach Gia and Phu Quoc Island. Such is the pace of change, that I wouldn’t be surprised if one or two more ferry operators arrive on the scene within the next year or two. All ferry companies have websites and contact telephone numbers, which I’ve listed below. In general, the ferry company websites are OK, but they aren’t always updated, and in some cases they’re in Vietnamese only (even if the language symbols suggest otherwise). Phone hotlines are also OK, and staff are generally well-trained, with enough English to communicate with non-Vietnamese speakers. But, as a general rule, the information on ferry company websites should be treated only as an indication of services, rather than the current reality. *Note: by the time you read this, Ngoc Thanh may not be operating boats to Phu Quoc anymore. *Please support Vietnam Coracle: You can search boat times, prices, and make bookings directly from this page for fast boats (not car ferries) between Phu Quoc, Rach Gia & Ha Tien by using the Baolau.com search boxes & links throughout this guide. If you make a booking, I receive a small commission. All my earnings go straight back into this website. Thank you. 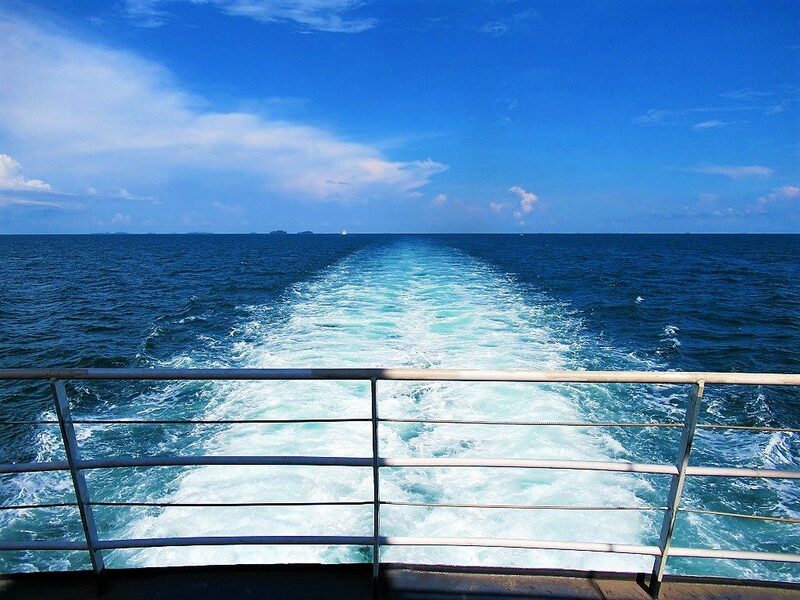 Below, I’ve listed all the sailing schedules and ticket prices (for passengers, motorbikes, and vehicles) for all the ferry companies on all the routes between the mainland and Phu Quoc Island. Bear in mind that all sailing times for all ferry operators are subject to change according to high/low demand and weather conditions. Therefore, the sailing schedules below should be treated only as a general guide; not as a fixed timetable. However, these days, you can pretty much guarantee multiple sailings in the mornings and afternoons from all ports, regardless of time of year. The only hindrance to your voyage might be weather: in the rainy season (May to October) rough seas can force companies to cancel their services. For the most up-to-date schedules, contact the ferry companies directly or, for selected services, check Baolau.com. *At least half a dozen sailings daily; extra sailings in high season (November-April). All sailings to Bai Vong port unless otherwise stated. Da Chong sailings change regularly. *At least half a dozen sailings daily; extra sailings in high season (November-April). All sailings from Bai Vong port unless otherwise stated. Da Chong sailings change regularly. PASSENGER TICKETS: Passenger tickets for all fast boat and car ferry companies can be purchased at the ticket offices at the boat piers or at offices in the towns of Ha Tien, Rach Gia, and Duong Dong (on Phu Quoc), or from most guesthouses, hotels, resorts, and travel agents on Phu Quoc Island and in Ha Tien and Rach Gia, as well as some in Ho Chi Minh City. Some ferry companies also offer online booking through their websites, but not all of them (see Contact for details). 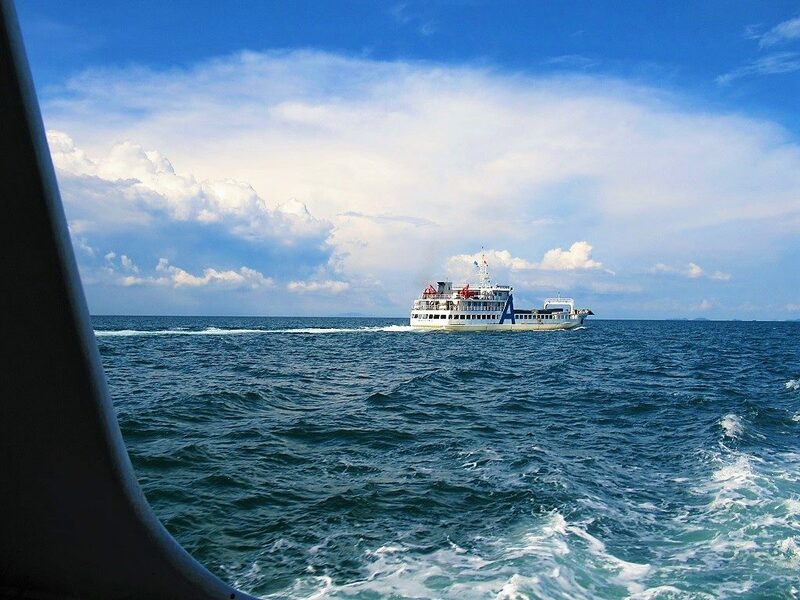 Alternatively, you can book most fast boat (but not car ferry) tickets online through Baolau.com. Ticket prices are more or less fixed no matter where you buy them (although sometimes there is a small commission charged), so most travellers simply book their tickets through their accommodation. Personally, I prefer to go down to the ports to book my tickets, but this is because I enjoy the atmosphere of the habourfront and I usually have my own means of transportation to get there. (*Note: it’s advisable to book tickets for fast boat services at least a day in advance, because they tend to fill up very quickly, especially during high season [November to April]). The two ports on the mainland (Ha Tien and Rach Gia) are both busy harbours full of boats. They can be easily reached on foot or by taxi or motorbike. On Phu Quoc, virtually all boats now arrive and depart from Bai Vong port, in the southeast of the island, which is a 15-minute drive from Duong Dong, the island’s major town, and most of the popular beaches. The only exception is a couple of sailings each day in and out of Da Chong port, in the remote northeast of Phu Quoc. 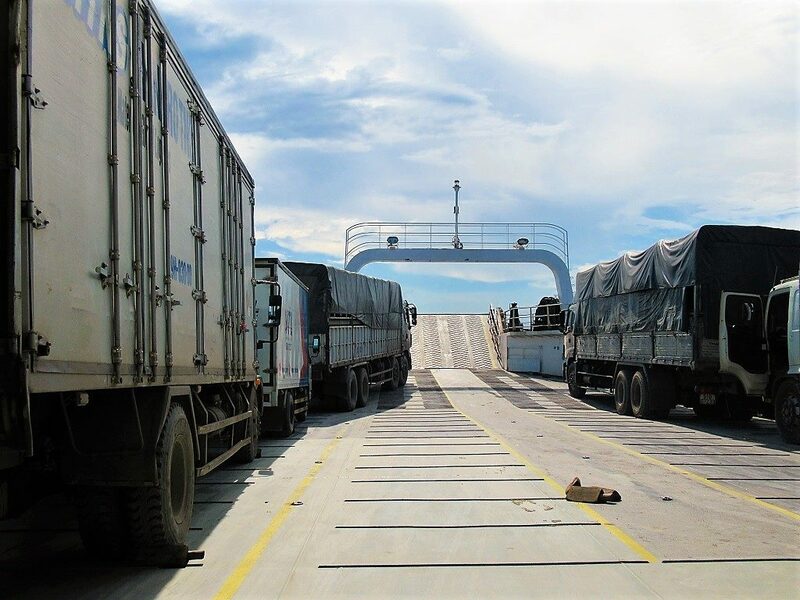 HA TIEN PORT: There are now at least three different ports in Ha Tien. They are all located on the south side of the To Chau Bridge; the other side of the river from Ha Tien town. The fast boat terminal has been recently refurbished, and now resembles the terminal of a small domestic airport. This is where all Superdong (including the Superdong car ferry), Phu Quoc Express, and Ngoc Thanh ferries arrive and depart. The terminal itself is sparse, clean, and easy to navigate. There are ticket offices inside, a waiting lounge, and several shops, cafes, and local guesthouses around the terminal. Arrival and departure is fairly smooth and efficient, although there’s a bit of a scramble on arrival as the boats are being unloaded, and there are so many ships these days that it gets pretty crowded on the pier. 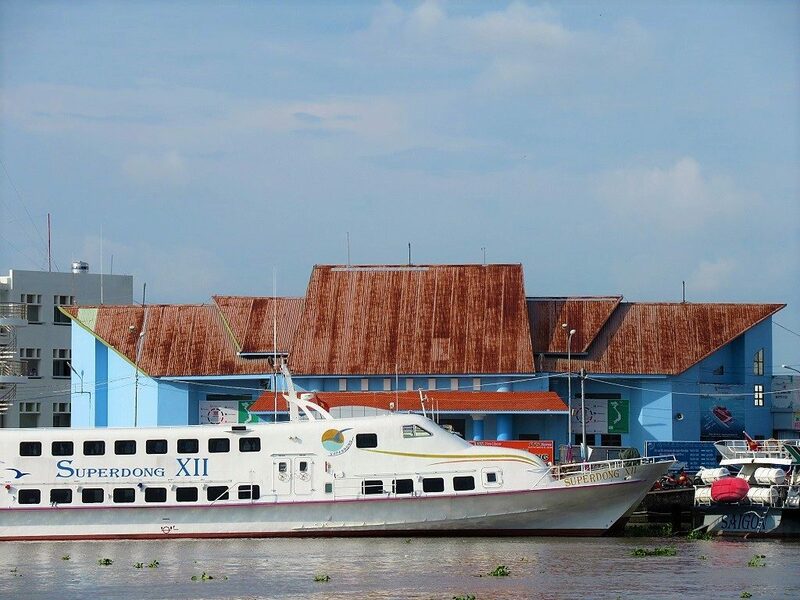 The Thanh Thoi car ferry has its own separate terminal, just a minute downriver of the fast boat pier. The port is very large, spacious, efficient and well-run, with ticket offices, waiting areas, and a cafe and shop. However, it looks as though the Thanh Thoi pier will soon be relocated (or at least shared) with a new terminal that’s under construction on reclaimed land just under the To Chau Bridge. 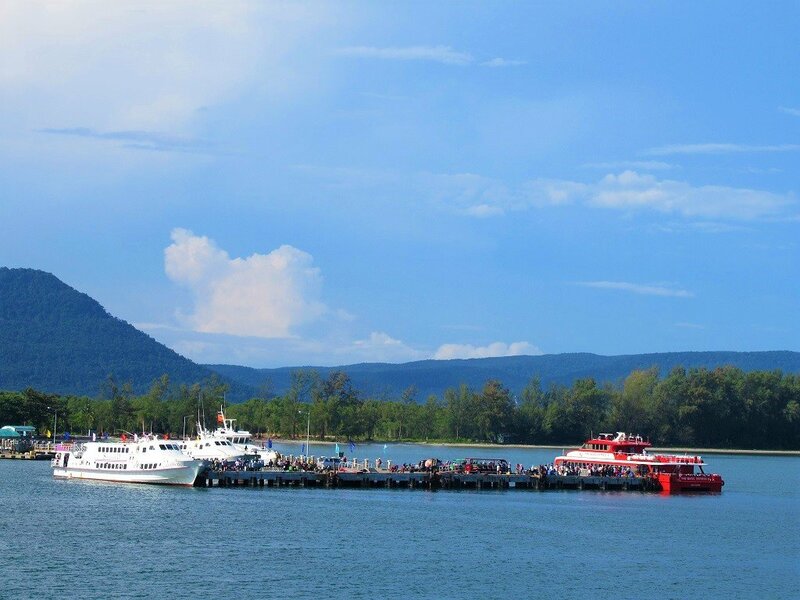 RACH GIA PORT: Currently, all boats to Phu Quoc from Rach Gia leave from the city’s main port. Fast boats (Superdong, Phu Quoc Express, Seabus, Ngoc Thanh) go from the main terminal, near the mouth of the canal; car ferries (Thanh Thoi) go from a new terminal just next door. The port is being expanded to accommodate the huge increase in ships, cargo, and passengers over the last couple of years. But, for now, Rach Gia port is overcrowded and a little bit chaotic at times. There are ticket offices, a waiting area, and a couple of shops in the main building. Things are set to get more modern, efficient, and generally better in the near future. BAI VONG PORT (Phu Quoc): A gaping bay on the south-central coast of Phu Quoc, Bai Vong is now the main arrival and departure port for almost all ships (fast boats and car ferries) to and from the island. The port spreads along the bay from north to south, and there’s still a lot of construction going on, as the port is expanding to meet growing demand. Fast boats (Superdong, Phu Quoc Express, Seabus, Ngoc Thanh) dock at the northern end of the bay, where a long pier stretches out to sea to meet the boats. Just south of the fast boat pier is the landing ramp for Binh An car ferries. And right at the southern end of the bay is the Thanh Thoi car ferry pier. At the fast boat pier there are ticket offices, a waiting area, local food and drink stalls, and a mini-mart. 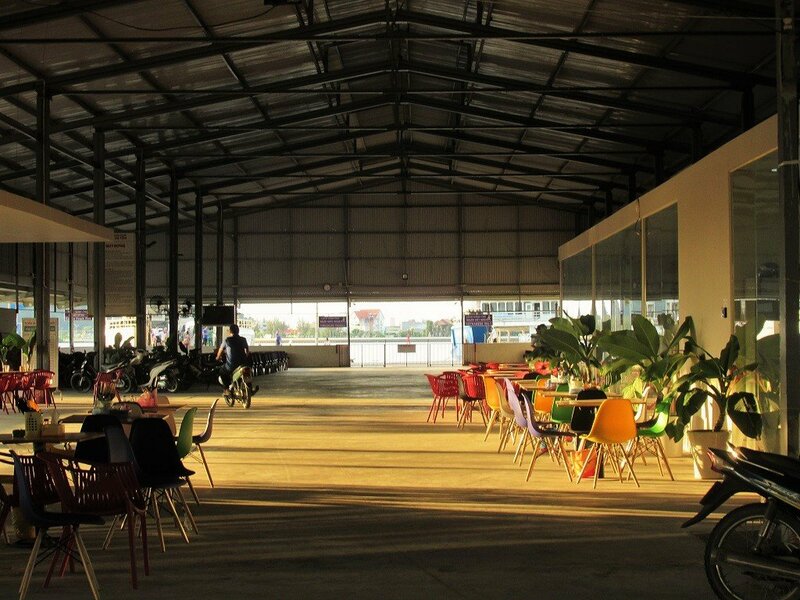 The Thanh Thoi port also has seats and refreshments. Although Bai Vong port is a bit of a mess at the moment because of construction, dust, and trucks, it’s fairly efficient and easy to use, as long as you know which ferry company you are travelling with. Taxis meet the boats when they arrive, or most ferry operators offer boat-bus combo tickets (at a extra cost of a few dollars) which allow passengers to get on a bus from Bai Vong port into Duong Dong (Phu Quoc’s main town), just a 15-minute drive away. DA CHONG PORT (Phu Quoc): Way up on the northeastern shores of Phu Quoc Island, Da Chong port is remote and quiet. 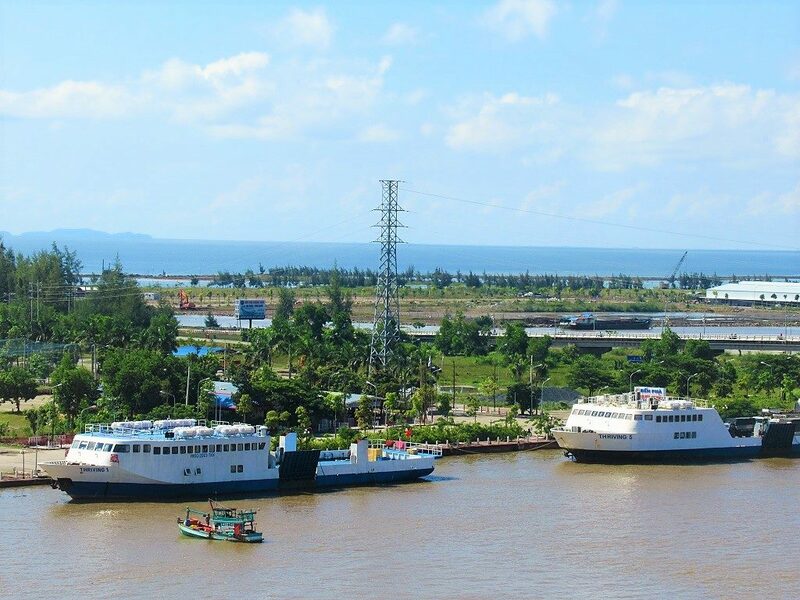 Presently, only one or two car ferries (operated by Thanh Thoi) use Da Chong port each day. It feels as though sailings to and from Da Chong are gradually being phased out, but there has been a fair bit on work on the harbour in recent years, so perhaps there are plans afoot for this sleepy (and very pleasant) corner of the island. There’s very little at all in the immediate vicinity, but the port has a ticket office, shop, and waiting room. Despite being so far from the island’s major towns and beaches, arriving at Da Chong is very scenic – with the high, jungled ridges rising sharply behind the port. However, it’s best suited if you have your own transportation. 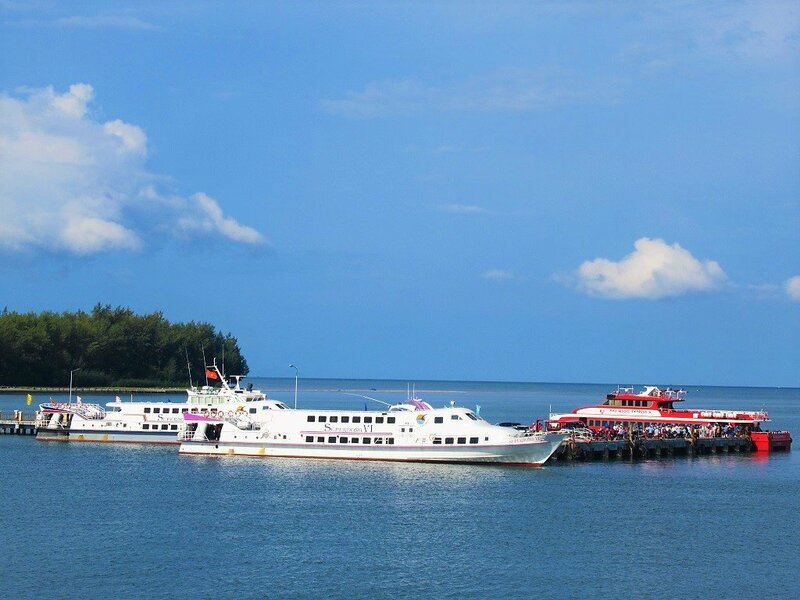 There are essentially two kinds of ships sailing between the mainland and Phu Quoc Island: fast boats and car ferries. Some companies operate both types, others only operate one. In general, all boats are comfortable and clean enough, with toilets and plenty of life jackets and life rafts. 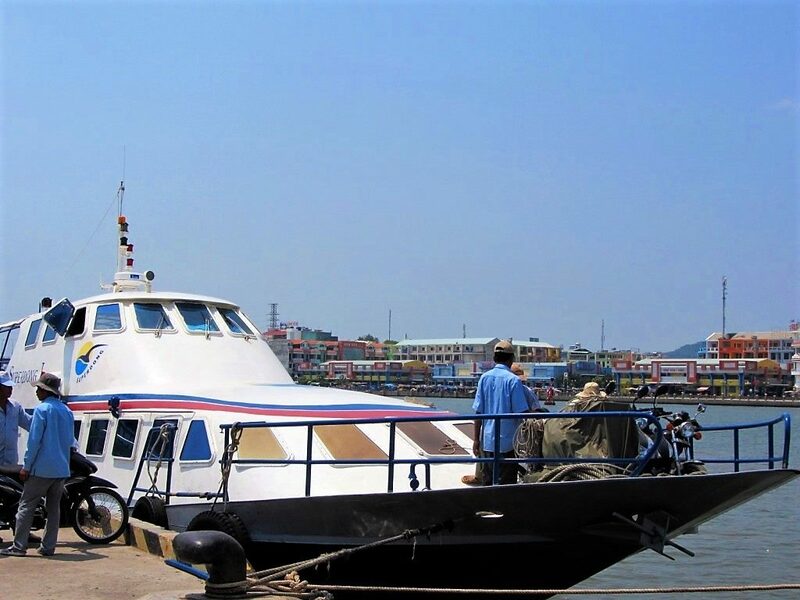 FAST BOATS: Fast boats, which are currently operated by Superdong, Phu Quoc Express, Seabus, and Ngoc Thanh, are relatively small vessels but very quick. 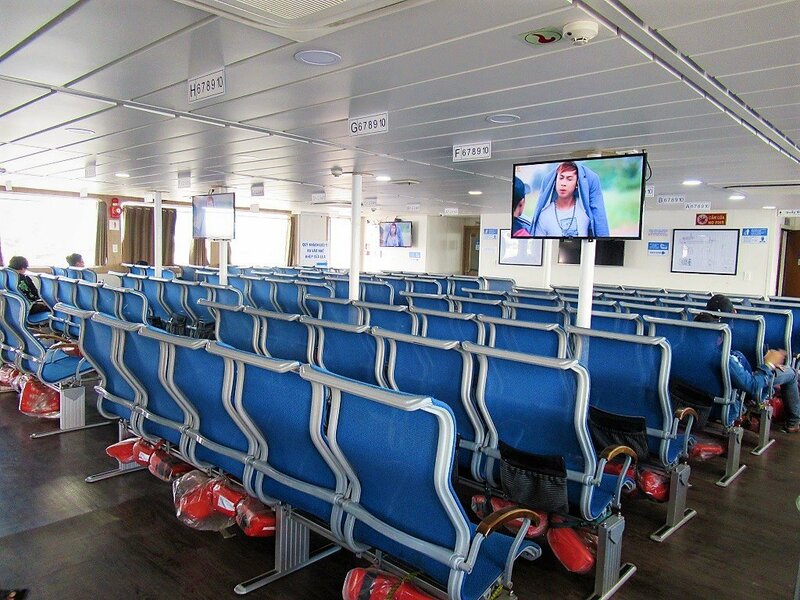 Each fast boat has the capacity for between 200-300 passengers and 10-20 motorbikes. 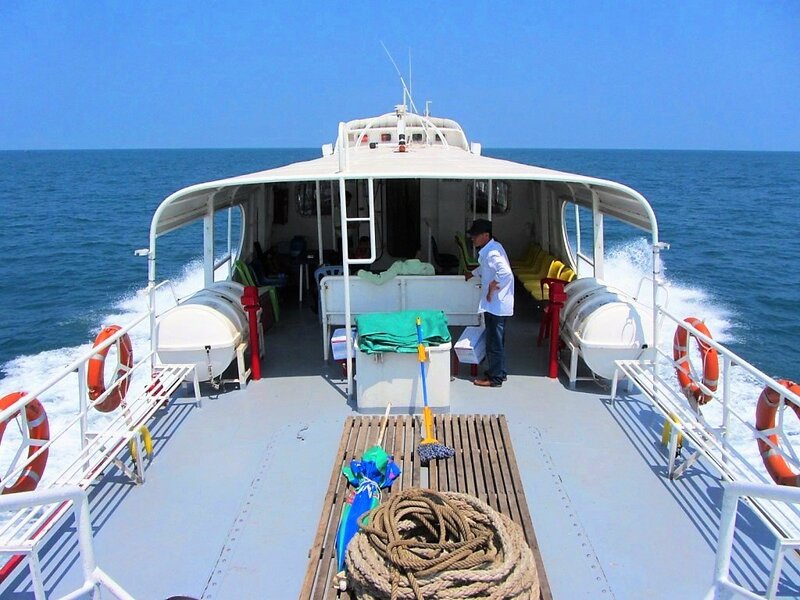 The fast boats operated by Superdong, Seabus, and Ngoc Thanh are all very similar, long and slender vessels. Seating is on soft, coach-style, reclinable chairs in two rows separated by an aisle. Air-con is set at a comfortable temperature (but sometimes too cold), and staff and young and polite. Most fast boats now have two levels: an upper and lower deck. There are large TVs which play soap operas, movies, reality shows, or music videos. The volume is quite loud, but you hardly notice it after a while. At the back, there’s a surprising amount of outside deck space, with seating on metal benches. However, the decks are closed for departure and arrival. Light refreshments, such as instant noodles, crisps, beer, coffee, and soft drinks, are available on-board at a little bar on the deck: prices are reasonable considering it’s a captive market. There are several toilets on-board, all of which are kept clean. 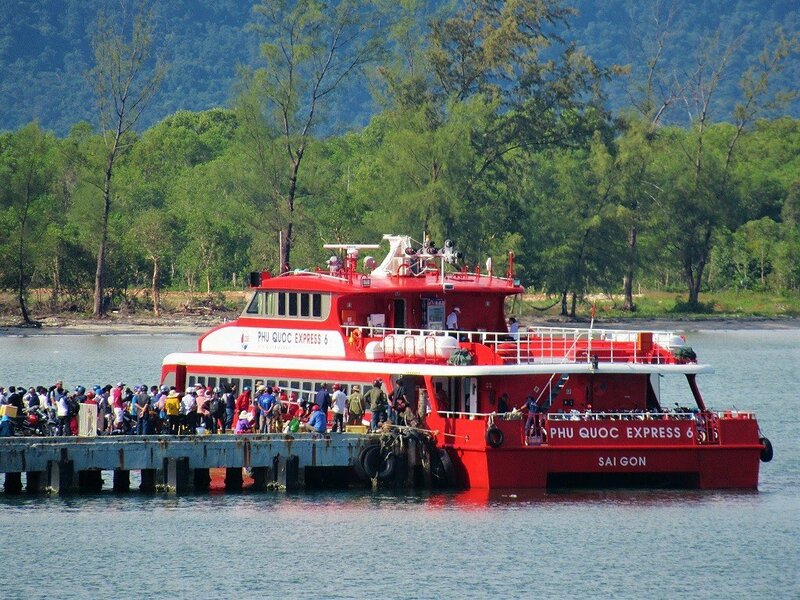 The Phu Quoc Express fast boats, however, are more modern catamarans. On-board it’s all very plush, and there’s even a VIP seating area, where you get your own personal TV. Regardless of which ferry operator you’re travelling with, the fast boats are all comfortable, quick, and smooth ways to sail to and from Phu Quoc. *Note: although there are railings around the outside decks, they are quite low and the deck can get slippery from the wash. A sudden swell on the ocean or blast of strong wind or small trip could send you overboard. Be very careful. CAR FERRIES: Car ferries are large, heavy vessels that generally take twice the time as the fast boats. But sailings are far more frequent, tickets are cheaper, and there’s lots of deck space for passengers enjoy, and plenty of room for motorbikes, cars and much larger vehicles, too. 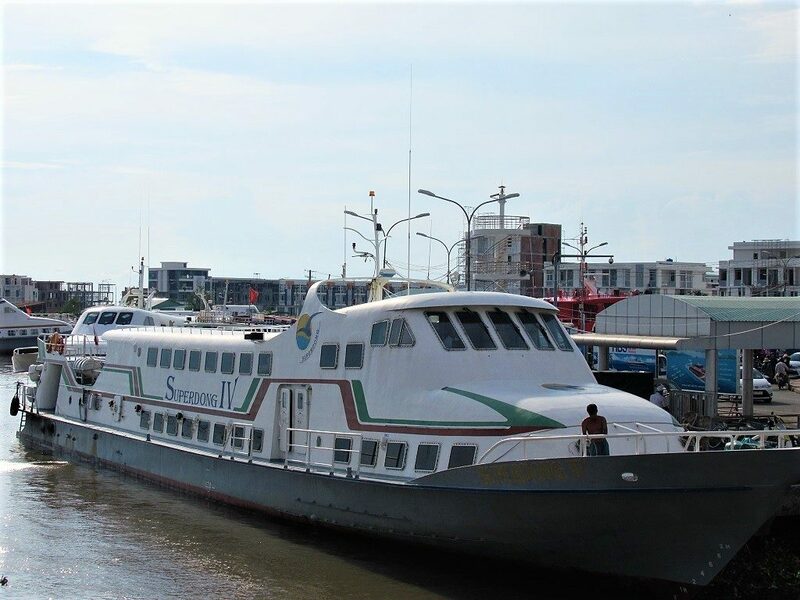 Currently, car ferries are operated by Thanh Thoi, Binh An, and Superdong, but Seabus is also set to join by 2019. Car ferries have capacity for nearly 400 passengers, 200 motorbikes, 30 cars, and several coaches and trucks. Seating is on soft, coach-style reclinable chairs across several decks. Some vessels are very smart, but others are starting to show signs of wear and tear. Toilets are plenty and fine. There’s usually a decent bar/cafe on-board offering snacks and drinks. 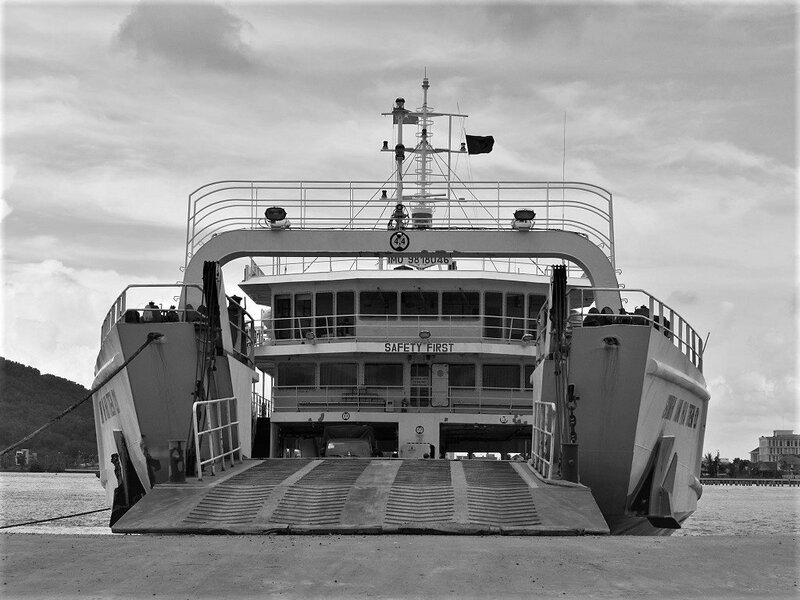 The Thanh Thoi car ferry operating between Rach Gia and Phu Quoc is a more modern vessel, complete with VIP seating area. 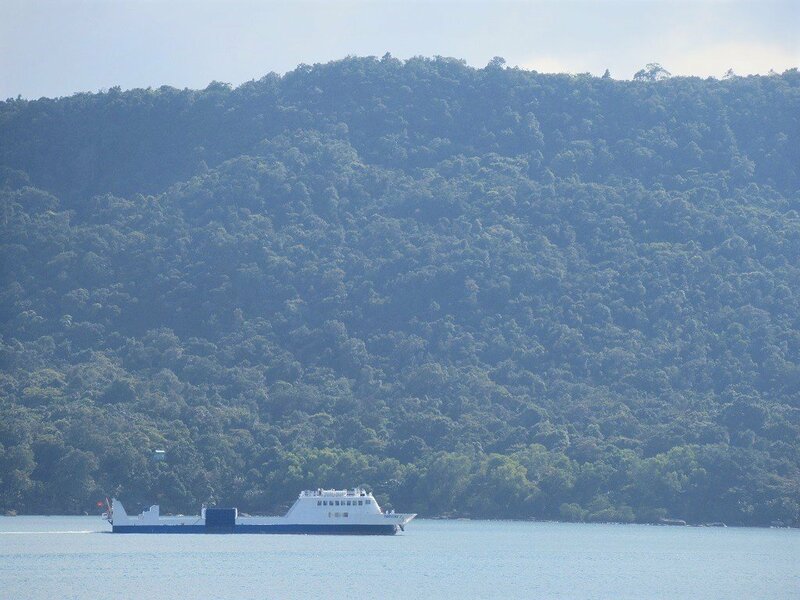 Personally, I find the car ferries more exciting than the fast boats – it feels more like a real voyage, and the spacious decks mean you can really enjoy being outside and at sea. Sailing from the mainland Mekong Delta to Phu Quoc Island involves crossing a beautiful corner of the Gulf of Thailand. During the high season months (November-April), the seas are usually calm and the skies clear. But during the low-season (May-October), heavy rains fall and storms can churn up the waves. On any of the routes, it’s an interesting and scenic voyage, taking passengers from the flat, agricultural, and densely populated Mekong Delta, to the hilly, forested, tropical shores of Phu Quoc Island. 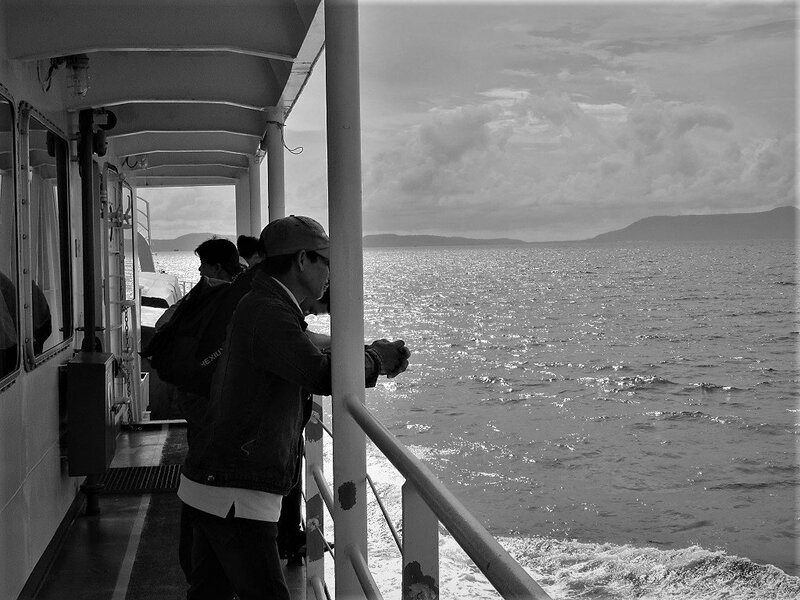 HA TIEN→PHU QUOC: Departing Ha Tien is lovely, especially in the mornings or late afternoons. 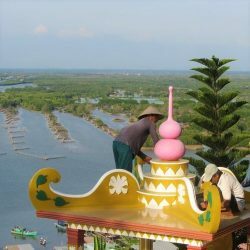 From the bustling harbourfront, the boat drifts out into the mouth of the Giang Thanh River, with the town of Ha Tien on the north bank, and the green, temple-studded To Chau hill on the south bank. Sliding under the harbour bridge, the boat enters the open sea. The mainland slowly recedes and the sea gets bluer as the fluvial waters are diluted by the ocean. Passing through the green and rugged little archipelago of Hải Tặc (Pirate) Islands, the ship ploughs on towards the purple mass of land on the horizon: Phu Quoc. Sadly, in recent years, the sea between the mainland and Phu Quoc has become densely polluted with plastic. Bottles, boxes, wrappers, bags are floating on the surface, bobbing in the ship’s wake for much of the voyage. Even so, as the silhouette of Phu Quoc draws closer, the sun appears to get brighter, the light sharper, and the colours more intense. With Bai Vong port in sight, the ocean becomes calm and placid. The excitement builds as the boat cuts its engine and glides to the pier. RACH GIA→PHU QUOC: A thriving city in the Mekong Delta, Rach Gia is a busy, slightly chaotic port to depart from. The boats jostle for space at the point where a canal meets the sea. As the ship maneuvers out of port – avoiding the hulls of other vessels by mere millimetres – the engines immediately roar to life and, before long, the low-rise sprawl of Rach Gia and its landscaped waterfront promenade are a speck on the horizon. Numerous Mekong tributaries and canals muddy the sea for miles, and weed-like water hyacinth grow in clumps on the surface, like large, green rafts. A scattering of lush, hilly islands provide an exotic backdrop as the boat steams further into open sea. Rach Gia is twice the distance from Phu Quoc than Ha Tien, thus the island isn’t visible to the west until halfway through the voyage. When it does appear, Phu Quoc seems small and insignificant. But, as the ship plunges on, the hills of Phu Quoc’s northern tip start to tower above the flat waters of the Gulf of Thailand, like the ramparts of a fort from the set of Game of Thrones. From the deck, you can see the weather moving across the island: billowing clouds building up and then dispersing as they unload on the island’s steamy forests. After nearly 3 hours at sea, the ship curves into Bai Vong port, on the gentle southeastern coast of the island. This entry was posted in ALL, DESTINATIONS, Ferries, Islands, Mekong Delta, Phu Quoc, Resources, The South and tagged boat, ferry, ha tien, Phu Quoc, rach gia, schedule, superdong, times. Bookmark the permalink. Yes, there are buses from Can Tho to Rach Gia and Ha Tien. I don’t know exactly what time they go and how much they cost, but that information should be easy to find either online or by asking at your accommodation when you are in Can Tho. From Can Tho to Rach Gia probably takes around 3 hours, and from Can Tho to Ha Tien probably takes 4-5 hours. 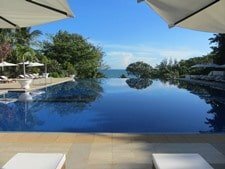 If you’re planning to take the boat to Phu Quoc and stay on the island over the Christmas period, bear in mind that this is high season, so you might want to book hotels in advance. You mentioned there are other ferry companies too, not just Superdong. I’m wondering if there are fast ferries to Phu Quoc from Rach Gia that depart later in the afternoon. The latest Superdong had was 1pm, but that might be too tight for us. Do you have any info on flights from Can Tho to Phu Quoc? Thank you! Yes, they sometimes put on extra sailings at peak times of year and weekends, but even then it’s usually just half and hour later. However, the slow ferries from Ha Tien go pretty much all day. For flights from Can Tho to Phu Quoc go to the Vietnam Airlines website. 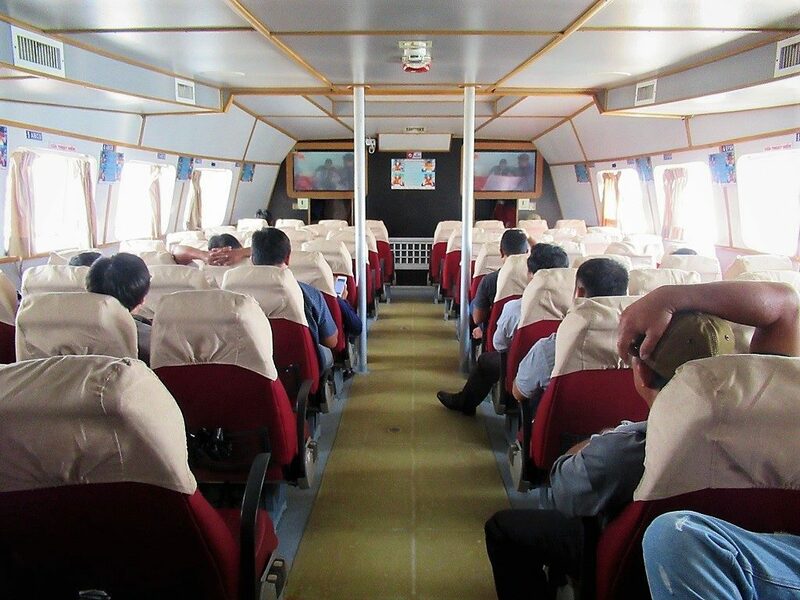 I need to book a ferry from Ha tien to Bai Vong Ferry Port online . please help! You can contact Superdong directly – this is their website. The location of the fast boat ferry in Rach Gia is marked on my map here. We would like to get from Sihanoukville to Phu Quoc next Friday in one day. You have any recommendation or experience which is the best ferry to take (should we book in advance?) because we don’t know how long it takes with the border crossing. Would be great if you could help us. I don’t think it’s necessary to book in advance at this time of year, however because it’s a Friday perhaps people will be going over for the weekend. I would try to get the afternoon ferry if you can: Leave Sihanouville early and get over the border by lunchtime. Even if you miss it you can just take one of the later slow car ferries instead. Hi Tom. Thanks for this article, nice and easy overview for the ferries. I’m thinking about going for a few days in early November as I’m living in Phnom Penh and we have some holidays around that time. However, a company here told me that the ferry doesn’t sail in November because the water level is too low. That sounded really strange to me, but I obviously don’t want to end up stranded (although I suppose there are worse places to strand) so I was wondering if you could debunk this for me? I’ve never heard that before, but I suppose it’s a possibility. Sometimes boats don’t sale because of bad weather during the summer months. But I’ve sailed to Phu Quoc in November before and had no problems. Good webpage (which Andy at Oasis Bar told me about) and there has been some changes to the car ferry service. There are now 2 Companies operating a service and these are soon to be joined by a Superdong car ferry service. The permanent service to Da Chong will start on 10th September 2017. The prices for car ferry that you have mentioned are correct except that the price you mention for a motorbike is for those up to 150cc. For bikes over 150cc the cost jumps to 320,000VND. 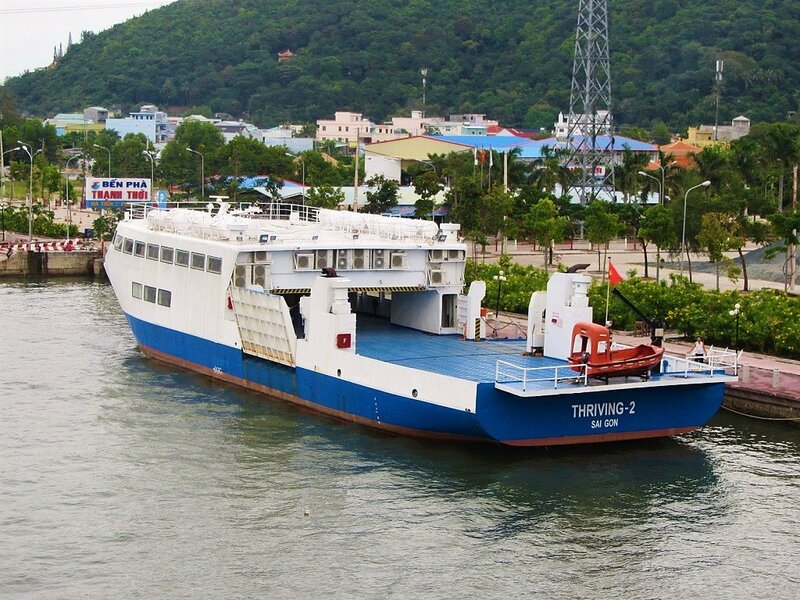 The car ferry post is no longer at Vinh Dam and has moved near the Superdong port at Bai Vong. All 3 Companies are based around here except for the 2 a day service from Da Chong. However, all car ferries do not go from the same place mentioned on your map. 2 ferries go from the opposite of the bridge. Thanks for the updates – sounds like they have been quite a few changes over the last few months. Good news for travellers having all those ferry services to choose from. I suppose it might not be such good news for Phu Quoc though, when all the cars start clogging the island roads. Thanks again, I’m sure readers will benefit from your information. You can take a day or night sleeper bus from Saigon to either Rach Gia or Ha Tien and then get the boat from there to Phu Quoc. Or if you go by motorbike you can follow my route. Then from Phu Quoc Island you can just take the boat back over to Ha Tien (it’s an nice town) to explore the Delta for a day or two. 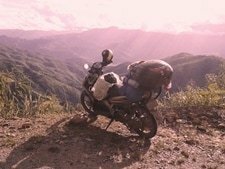 A mate and me are getting ready to embark on a month long motobike trip across Vietnam. We are booked to fly into HCMH and were then considering a flight to Phu Cuoc and beginning our bike trip there after spending a couple days on the island. My question is do you think it would be possible to buy 2 bikes in Rach Gia or Ha Tien after taking the ferry off of the island? We are trying to save a couple travel days but I am concerned about a possible lack of bikes for sale out of HCMC. Thanks! Yes, I think it might be difficult to pick up a bike in Rach Gia or Ha Tien. Perhaps you could try contacting Andy from Oasis Bar in Ha Tien and see if he can help you out. Or maybe Tigit Motorbikes or Flamingo Travel (both in Saigon) can arrange dropping your rental bikes in Rach Gia or Ha Tien. But I think it would make more sense to either fly back from Phu Quoc to Saigon and get your bikes there, or simply ride Saigon to Phu Quoc and back again – it’s a pretty interesting ride if you follow this route. Thanks a lot for getting back to me. Looks like my concern was valid and we will have to consider other options. I will try and get in touch with Andy as well and see if he can possibly help. Worst case scenario we can fly back. Thank you for all your posts! I would like to know if you can help me with the route Phu Quoc – Pnhom Penh. I will travel next July and I would like to travel from Phu Quoc by boat in direction of Pnhom Penh, I saw that the best port for that will be probable the HA TIEN. 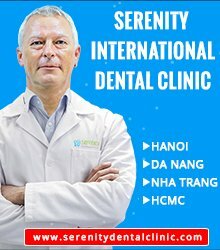 Do you have any advice to do HA TIEN to Pnhom Penh? Your site has been so helpful as I’ve been planning my Vietnam trip. I was wondering if you had advice about booking these ferry tickets ahead of time- I can’t seem to figure out how to do it on their site and I worried that they might sell out considering that I want to travel on New Years Day. Is it possible to purchase online ahead of time? Are seats first come first server? I have never personally booked in advance, but my friends have, and yes it’s a good idea to do that if you are going to be travelling during the holidays. Just click on the link to the Superdong website in this article and it will take you to the English language version of their homepage. Then click ‘Ticketing System’ in the top menu. On the next page it has the phone numbers and addresses of various ticketing offices, including a hotline. 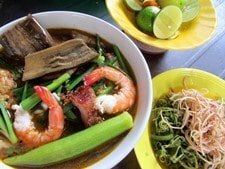 bonjour tout le monde,je souhaiterai partir en avril a phu quoc mon trajet sera Lyon-Bangkok puis Bangkok ou Cambodge ou Hồ Chí Minh-Ville pourriez-vous me dire lequel de trajet serai le mieux en prix et le plus rapide pour me rendre a phu quoc svp ??? merci . I’m sorry, I don’t speak French. But you can follow the Phu Quoc boat schedule on this page for information about prices and times to Phu Quoc. Great info thanks! We’re taking one of the ferries in 2 days. Not sure yet whether the slow or the fast one. One question, do you know how do we get to the port in Phu Quoc? I imagine a taxi could be very expensive. It depends which ferry you are going to take: if you take the fast boat the port is not that far from Duong Dong Town so you could take a taxi or I’m pretty sure there’s now a bus service between Duong Dong and the port specifically timed for arrival and departure of the boats – ask the reception at your hotel. But, the port for the slow boat is quite far so, yes, a taxi would cost a bit of money and is probably the only option. Phu Quoc sure is an amazing island! I love the superdong fast ferry! What a fantastic find Vietnam Oracle is. Vast amount of very useful info! Can I please double check and confirm about ferry travel time from Ha Tien to Bai Vong which according to the schedules say take approx 1.5 hours? Also, would you have any info regarding Superdong operation in month of June? Would I be right in saying the month of June is within the quieter season and therefore there may not be a 1:15 departure from Ha Tien or is that a regular? The link to their website appears to be currently broken. 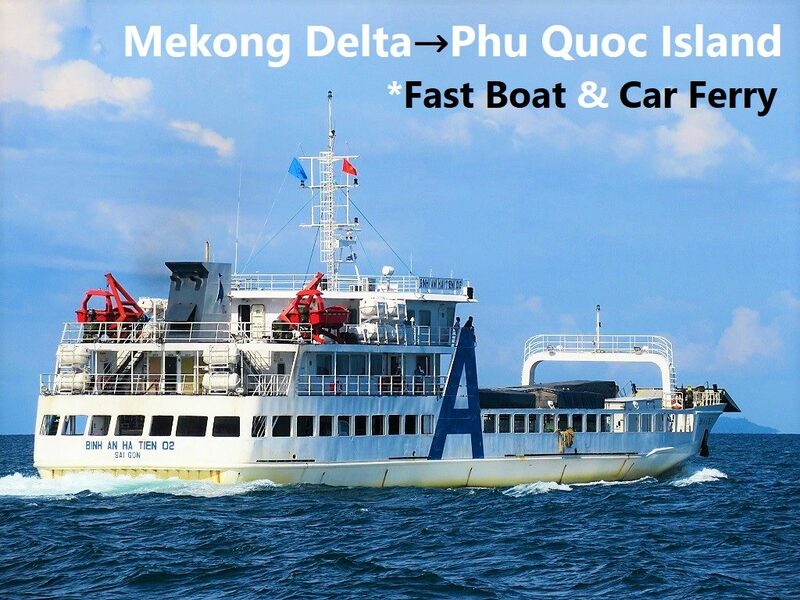 Yes, that’s right, the fast boat (not the car ferry) takes a little less than 1.5 hours to reach Phu Quoc (the car ferry takes around 2.5 hours). 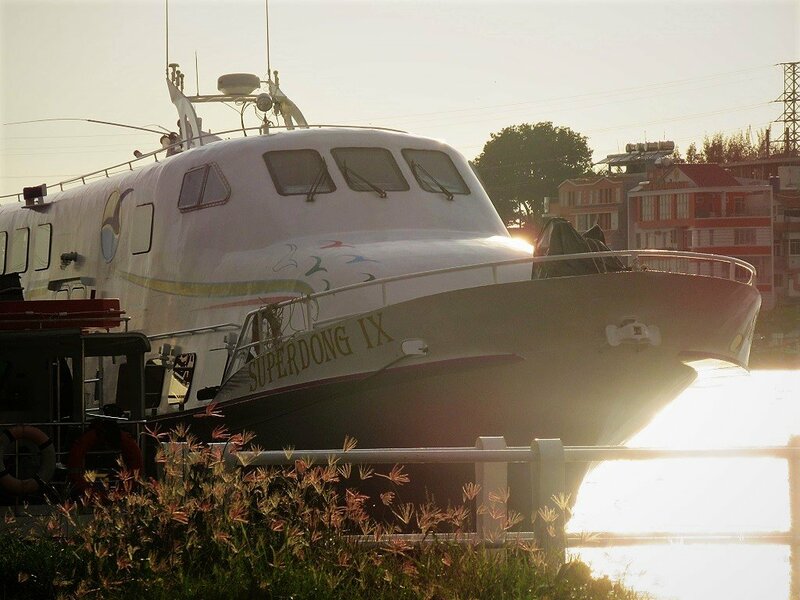 In June I would think that the Superdong schedule would be normal – that is, they would not have the extra sailings that are usually put on for public holidays. The 1.15 is on the regular schedule so that should be OK. Very good. Really appreciate that. 1. We eventually got tickets in Sihanoukville included a taxi from the border. A bit pricey (17$ per person) but they waited at the border and drove us directly to the pier. A tip for other travelers is to buy a return ticket at once if you go out of Phu Quoc and then back. 2. The bordercrossing went ok, but you have to show your papers 4 times, and you have to walk about 300 meters from Cambodia side to Vietnam side. Calculate 15-20 min if you are early. Note: do not pay the guards anything even though they say you have to pay “doctors fee”. Glad to hear the crossing was OK. Thanks for sharing your experience of the border and travel across it, I’m sure that will be helpful to many other readers. Thanks for the info, came in super-handy. We’re actually planning on going to Ha Tien from Phu Quoc with the fast boat, then from there head to Sihanoukville, at least that’s the plan. 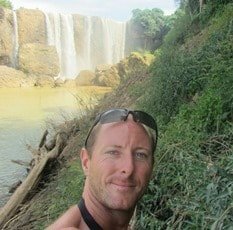 Is there somewhat reliable bus service from Ha Tien or across the border on the Cambodia side to there? I’m suspecting there is, but just want to confirm. I’m pretty certain there are good buses/companies that take you from Ha Tien across the border to Cambodia and further, but I don’t have any specific names. Hotels in Ha Tien are all set up for organizing that kind of route so there will be plenty of information when you get there. 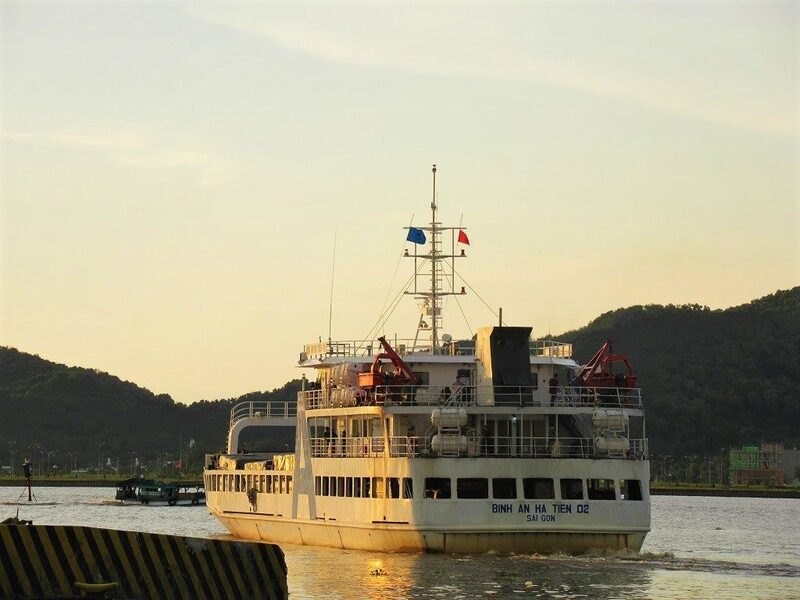 If you’re getting the boat from Phu Quoc to Ha Tien sometime over the next couple of weeks, it’s advisable to book your boat tickets soon as they can sell out during the Lunar New Year holiday, which is starting around now. Hope you are able to give us answers to some questions nobody seems to know. 1. Is it only possible to buy tickets for the superdong in ha Tien? We are trawling from Sihanoukville by taxi and not with the local bus companies. We would like to get tickets before arriving at the ferry in case it is full. 2. Is it usually much hassle when going out of Cambodia and in to Vietnam at the Ha Tien border? We have visa as we have already been in Vietnam. Yes, it’s easy to buy tickets for the Superdong in Ha Tien – you can buy them through your hotel or at the ferry pier either before you travel or on the day of travel. It shouldn’t be any hassle crossing the border from Cambodia to Vietnam at the Ha Tien border. I have not heard of travellers having problems there. But please let me know how it goes. 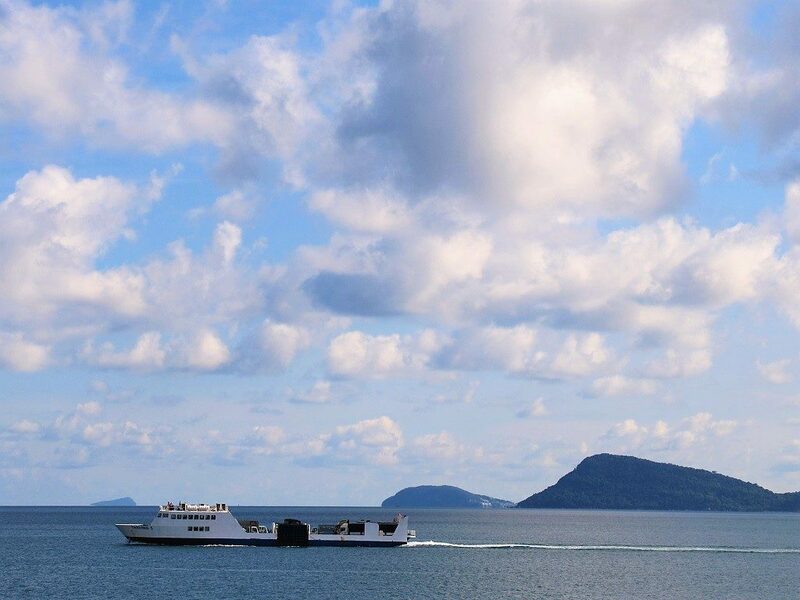 As of December, 2015, the car ferry departed Phu Quoc to Ha Tien at 12 pm and 3 pm. The road to the dock is crazy muddy and bumpy, and is slow going. It seems like the car ferry is the way to go, because you don’t have to book in advance, fight with the porters, and it’s cheaper. However, they did almost kill me. I was standing at the railing of the waiting area taking pictures of the arriving boat, with dozens of fellow passengers. They threw a rope with a very heavy weight, and it came within inches of smashing me in the face. Everybody just smiled and laughed, so I wonder what sort of recourse there would have been if it had hit me. Thanks for the update. I can’t believe they haven’t paved the road from the dock yet. However, it won’t be muddy much longer because the dry season is here now: pretty soon the rains will stop and the mud will turn to dust. 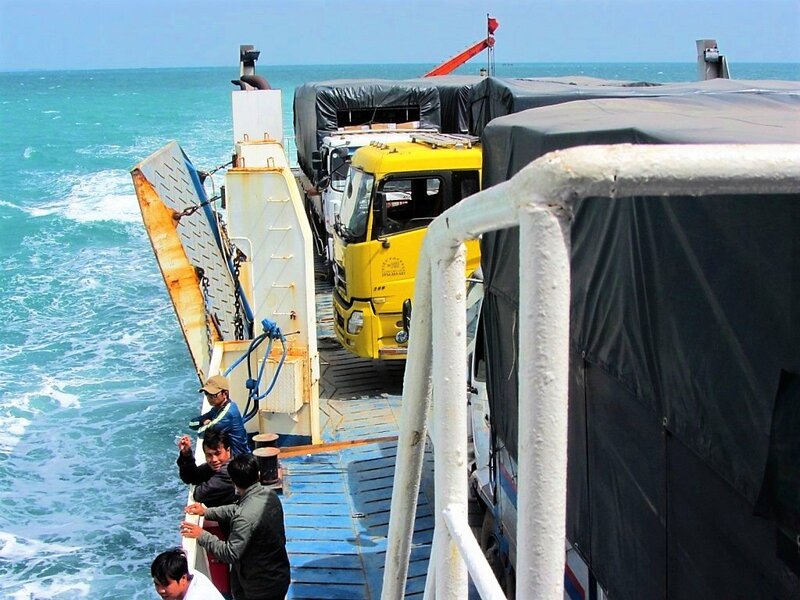 Yes, Vietnam isn’t known for its high standards of health and safety, especially when it comes to marine travel. I will visit Ho Chi Minh City on 16th, 17th and 18th. Then I have to be on Phu Quoc on Friday 20th. Well, it’s normally pretty easy to get from Saigon to Phu Quoc island by bus to Rach Gia or Ha Tien and then boat to the island (see relevant comment in this thread). However, as you are travelling right at the peak period (just after Tet day) you may find it difficult to get a ticket and companies may also bump up prices a bit. I would get your ticket/s as soon as possible, otherwise they might all be gone. Ask around the travel agents and bus companies in Pham Ngu Lao in Saigon’s backpacker district. Thank you so so so very much for posting this information. It’s been a lot harder to find information on the schedules and recommendations than I thought it would be. I plan on spending about two weeks in the Mekong Delta area and hope to make my way out to Phu Quoc. From what I’ve read, thieves seem to be terrible in Rach Gia? I am a very safe and smart traveler but it seems as though it is more prevalent there than most places I’ve read about. 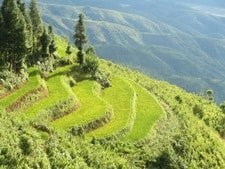 Did you feel unsafe traveling through Rach Gia? I have never heard any complaints about thieves in Rach Gia before. Although I’m sure there are some thieves around, I’ve never encountered any problems in Rach Gia before, and I’ve never felt unsafe there. If, as you say, you are a very safe traveller and take all the normal precautions against robbery, then I should think you will be absolutely fine. Safety aside, of the two Mekong Delta towns that run boats to Phu Quoc, Ha Tien is the nicer. Thanks for good information. I can confirm that the Superdong from Rach Gia to Phu Quoc is still 350000 dong, (12/12 2014). Also I can recommend people traveling from Saigon to take a Mekong delta tour and stay one night in Can Tho before continuing to Rach Gia. Tour operator will be happy to help arrange this. For budget travellers it seems from my experience that you don’t have to book the ferry in advance, you might as well buy it in Rach Gia, as you have to collect your ticket in the office anyway. Thanks. I’m sure my readers will benefit from your experience on this trip. Hello! Do you know if a visa is still needed for phu quoc if coming from cambodia? Likewise, what is the return process into Cambodia again? And would you consider it a worthwhile trip to phu quoc or better to check out some cambodian islands? I’m pretty sure you still need a visa, yes. But better to check when you’re there for most recent info. Thank you this information is valuable. I am looking at spending Tet 2015 on Phu quoc and would like to take the ferry from Rach Gia on the 18.02.2015. Can anyone assist in letting me know if there would be timetable changes at this time? thank you in advance. As far as I know the ferry schedule will be the same or at least similar: two boats every day in both directions, one in the morning, one in the afternoon. But you should check closer to the date you travel to make sure: take a look at the Superdong website which is listed on this page in the introduction. Thank you very much for this very usefull and helpfull web page.